The mother-in-law and son pair who hand-craft these spice mixes make them the best way, not the easy way. "If you talk to anybody who barbecues," says Robert Orth, "they'll tell you the secret to it is not the sauce—it's the spice rub." And the secret to a great grilling rub is to use the highest quality hand-crafted seasonings, like the ones Robert and his mother-in-law, Autum Ellis, create. Shortcuts are not for them. They source single-origin spices from generations-old, pesticide-free family farms around the world: France, Sri Lanka, Israel, Indonesia, Morocco, and the Caribbean. Then, working in small batches with the raw, whole spices, they make the most of each type's flavor profile by hand-toasting and grinding them. Immediately afterward, they hand-blend the spices and let their flavors marry. No fillings. No chemicals. 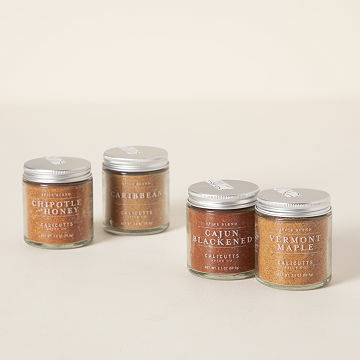 The regional inspirations of these lip-smacking blends are evident in their names: Cajun Blackened, Caribbean, Chipotle & Honey, and Vermont Maple. Packed in a kraft paper gift box, they make a red-hot present for anyone who loves to grill. Handmade in Hershey, Pennsylvania. After embarking upon a pursuit for the ideal barbecue rub, Robert Oth realized how much the quality and origin of spices affect a dish. An academic by day, Robert researched how to create high-caliber spice blends. The answer: spices that were carefully sourced, then toasted, ground, and blended fresh. He decided to start a business doing just that. Just as he was realizing he needed help to scale it up, his mother-in-law, Autum Ellis, happened to be looking for a new career. "People have these preconceived notions about son-in-law/mother-in-law relationships," Robert says. But she'd been one of his biggest supports from the beginning, so it was natural for them to become a dynamic business duo. Together, they coordinate the importing of spices from all over the world to Central Pennsylvania and make handcrafted, small-batch spice blends from freshly sourced, toasted, and ground spices. Everything we have had from this company is amazing. Pure flavor with no artificial ingredients. Great product. Purchased as a gift for my step-father and he loved it. Unique and special gift that was out of the ordinary. I got this for a friend for her birthday because she recently bought a new grill. I love the different variety of spices that they have in this package to fit different tastes and moods.